Dr. George C. Trachtenberg received his D.P.M. degree in 1977 from the Temple University School of Podiatric Medicine. He has maintained a successful private practice since June of 1977 and is currently in Vestal, New York. Our goal is to provide the highest quality foot care to patients with painful foot conditions, abnormal foot function and foot-related postural problems. This is achieved when: Excellent care is given with a strong emphasis on prevention Patient's needs are met Patient's expectations are exceeded A practice standard is created against which foot care in the region is measured. In fact, we have earned a reputation for regularly exceeding patient expectations, as well as providing some of the latest advances in podiatric medicine. Advances that will help us continue to offer the finest in medical and orthopedic foot care. Rate and review George C. Trachtenberg, D.P.M in Vestal, NY, United States! 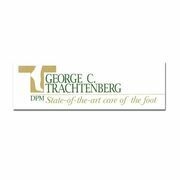 Share your experiences at George C. Trachtenberg, D.P.M with your friends or discover more Podiatrists in Vestal, NY, United States.